The yoga practices of asana, pranayama and mudra are geared at accessing the energetic body. They work to cultivate the free flow of prana throughout the body, releasing physical, emotional and energetic blockages to help bring the body toward greater health. However, very few yoga teacher training programs educate instructors on how to navigate the energetic terrain of the body. A yoga teacher who may be in contact with 8 to 80 people in one day would benefit from learning how to protect their own energy and how to properly interact with their students as energetic beings. 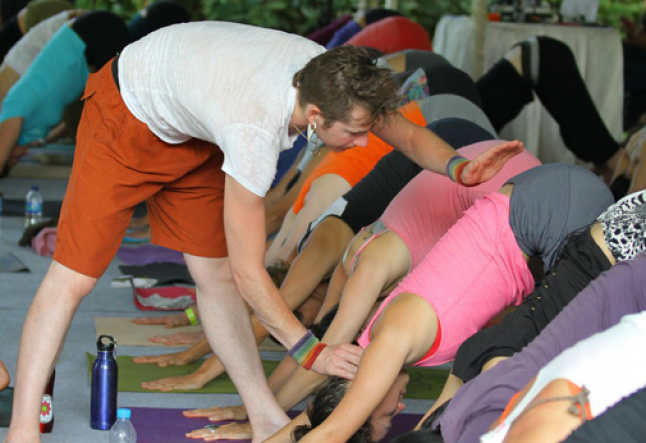 As yoga teachers, we have a responsibility to be aware of the energetic relationship with our students: it is our job to hold a safe, sacred space for healing practice and to ensure that students are not energetically impacted in a negative way. Secondly and most importantly, we have a responsibility to ourselves to care for our own energy bodies. When we do not cultivate and care for our own energy body we are more likely to feel exhausted and drained after teaching and are more prone to illness and injury. We can sometimes take on our student's energetic issues or problems or inadvertently allow our negative energy to seep out to our students. - Cleanse your entire body each day. This could be as simple as imagining your energetic system being washed off as you shower or using smoke from sage wands to cleanse your energy body each day. - Wash hands after each class, this is a simple tip for staying healthy physically, but also ensures that you energetically cleanse anything you may have picked up while providing physical adjustments in class. - Use your breath or sound to clear your energetic system. If you leave class feeling like you have picked up emotions or energy that is not yours (this can manifest in sluggishness, or emotions that arise for no reason) do a few rounds of Lion's Breath or Brahmari Breath to clear out your system. A little breath and sound go a long way! - Arrive early, give yourself time to arrive in the space and to feel grounded. - Honor the space as sacred: light candles, light incense or smudge the studio. - Ground your physical body in the space: connect your feet and your seat with the Earth. - If you have time or you know this class to be one where there are a lot of physical/emotional releases, visualize an energetic cocoon around the room and individual cocoons around each student and yourself. - Create a clear opening and closing to the class. Open and close with the sound of Om, use chanting to begin or end class, use the sound of Tibetan bowls to open or close. - Be sure to release your students at the end of class. This can be as simple as ending with Namaste or bowing to each student as you end. - Stay grounded! Find your connection to Earth throughout class. If you are feeling spacey or not present, reconnect with the sensation of your feet or your seat on the floor. - Be mindful of physical adjustments. Each time you touch a student you are not only touching their physical body, but their energetic body as well. Sometimes a verbal cue or demonstration will work just as well as a physical adjustment. If you are going to touch a student, be mindful of your touch and honor them physically and energetically. - Notice the energy of the class, if things feel off, shift energy. If things feel heavy, sluggish or sad invite some lion's breath or brahmari breath into the practice. If you notice the sensations of aggravation, friction or anger invite the chanting of Om or shift to a grounding practice that allows students to connect with the feeling of their feet on the floor. - You are not there to practice, you are there to hold space. It is difficult to be present for your students when you are involved in your own practice. Step back from demonstrations and resist the urge to practice with them. - Have an awareness of your own body, senses and feelings, if something feels out of place ask “Is this mine?” The more you can be grounded in a firm knowledge of your own energetic system, the better you can address issues that cause the energy body to become unbalanced. Remember, your most important tool is you! Get to know your energy body, explore is contours, its flows and its boundaries. The better you know yourself the stronger your energetic boundaries will be.